Outdoors or indoors, hot or cold, dust or water - all this does not matter to the Getac ZX70. 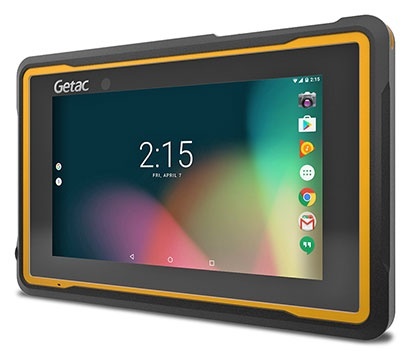 With this ultra-rugged Android tablet you get a mobile device that handles nearly all the challenges of industrial and outdoor applications. The rugged nature of the tablet is mainly due to its cleverly designed housing: it protects the interior in case of falls up to 1.82 m, is IP67-certified to be completely dust-proof and keeps the electronics dry even if the ZX70 is briefly completely immersed in water. According to MIL-STD-810G, the operating temperature ranges from -21° C to +60° C, even between -40° C and +71°C when stored between usages. Of course, a tablet for demanding use must not only be robust, it should also not weigh much - and with just 780 g, the ZX70 is extremely lightweight for such a rugged mobile computer. In the accessory portfolio you will find carrying cases, shoulder straps and wrist straps which simplify transport and handling. Thanks to its dimensions of 218 x 142 x 27 mm, the tablet is also conveniently placed in briefcases, backpacks and other bags. The capacitive 7'' touch screen made of tempered glass (resolution 1,280 x 720 pixels) supports multi-touch and is also designed for the needs of employees who use the tablet in full protective clothing and do not want to (or who cannot) take their gloves off for every operation. In addition, there is the option to write and navigate with the capacitive stylus. Getac's LumiBond technology ensures clearly recognizable and readable display screens, even when exposed to direct sunlight. The ZX70 comes with the concentrated performance of an Intel Atom x5-Z8350 processor with 1.44 GHz. For appropriate computing power rely on 2 GB of memory, and if required, it is expandable to 4 GB. In addition, the user has 32 GB of internal memory in the form of a shock-proof embedded multi-media card. Again, an extension is possible, quickly and easily via the MicroSD slot. The ZX70 connects to peripherals, such as headsets and barcode readers, via Bluetooth 4.0, and it accesses web and database content with WLAN 802.11 a/b/g/n. For usage outside the network, there is optional 4G LTE broadband access. For photographic documentation - even in unfavorable lighting conditions - use the 8 megapixel camera with LED flash located on the back of the tablet. On the front is also a full HD webcam for video conferencing with sharp images. With the corresponding dock you also use the ZX70 in a stationary fashion, for example, when working in the office or navigating onboard a vehicle. For this purpose, you choose between two different optional stations, one variant for the desk and one for vehicles. Thanks to vibration protection and e-MARK certification, the tablet also handles off-road tours - and the highly sensitive GPS ensures that the user always has an overview of his current location. To further enhance its range of applications, expand the ZX70 with a barcode scanner, a UHF RFID reader and an RFID/NFC combination reader. A vehicle adapter also increases the recharge time of the tablet in the field.